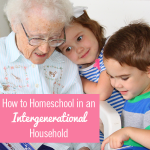 I read this article and wanted to share it with you: How to Homeschool in an Intergenerational Household https://blog.sonlight.com/intergenerational-homeschool.html. My mom’s bedroom is right down the hall from us. She moved in shortly before my second child was born. She has been a constant in their lives since they were little. She helps feed them, dress them, play with them, and yes, educate them. 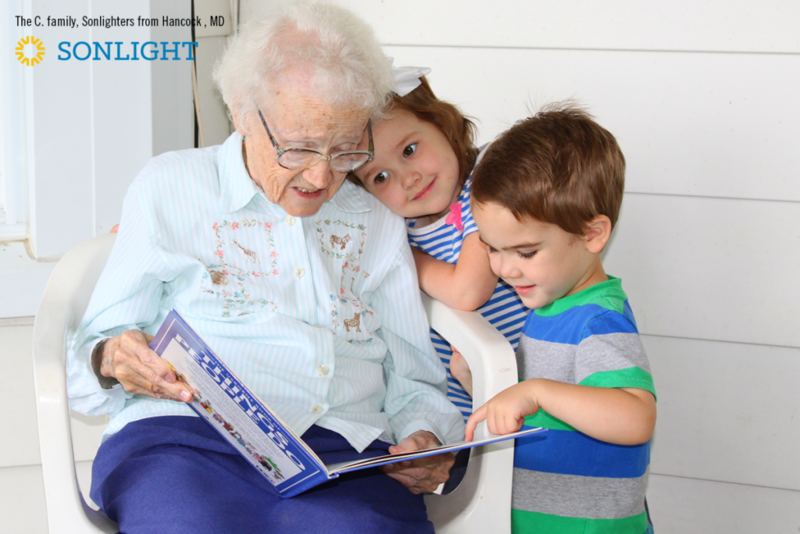 In our home, Grandma is a vital part of our homeschool experience. We have an intergenerational approach to homeschooling. When we elected to homeschool—a decision my husband and I researched extensively—it was important for us that Grandma also be on board. I value my mother’s opinion and I hope my daughter grows to value mine as well. Thus, when we chose to homeschool, I was very careful to introduce it as something we were going to commit to fully and not merely a passing fad in our parenting. Fortunately, my mom quickly understood the myriad benefits of homeschooling and was on board with the decision. My mom has been instrumental in their education from day one. I’d be hard pressed to find a day when my mother wasn’t singing nursery rhymes, reading books, or letting my children help her prepare something in the kitchen. So when we began to research curricula, it was essential that we all be comfortable with our choice. All three of us would be working together to raise and educate our kids. We would be homeschooling in an intergenerational home. One of the best decisions we made was to use Sonlight as our base curriculum. 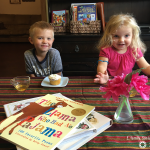 The materials are well suited for use with a family that has more than one pair of hands in the “homeschooling kitchen.” As I type this, I can hear my mother laughing while enjoying a read aloud with all three kids in the other room. While dinner is being made, my husband will likely be pouring over one of the Usborne Science books with the kids in awe over the amazing facts and beautiful illustrations. 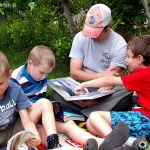 We benefit greatly from being able to complete the Read-Alouds, Bible stories, and Science experiments as a family, with all three adults participating. Having other adults interested in what the kids are accomplishing provides a built in show-and-tell. My daughter loves to show her Timeline Book to her father and grandmother and introduce them to the characters she has met this week, whether Adam and Eve or Abraham Lincoln. The children involve all of us in pretend play featuring their favorite characters. For example, while reading The Boxcar Children, we built pretend campfires, pressed flowers, and learned how to wrap a dog’s injured paw. Like every other homeschooling family in the world, we have exceptionally good and exceptionally bad days. 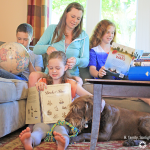 Homeschooling with three strong-willed and opinionated adults in one house can get tricky. Keeping track of who is doing what when can become overwhelming at times. More than once we have found ourselves promising a trip to the park when another adult had already planned to finish a Read-Aloud. 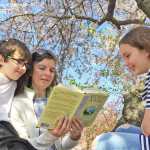 Through trial and error, our family has identified key strategies for making the most out of homeschooling in an intergenerational household. While this may seem obvious, it can be almost impossible to homeschool successfully without everyone in the household being on board. Clearly communicating your goals as a family is key for peaceful learning. We have a clear plan showing what activities have to be completed before moving on to the next level of activity. 3. Have adults take ownership. Make a clear notation of who will be covering which items on the to do list or in the Instructor's Guide (IG). We know several families that have success with Dad covering Science, Mom leading Language Arts, and Grandma reading the read alouds. We chose not to do go this route because we wanted the kids to see each of us working with them on the different subjects even if they were not our favorites. Instead we typically let the child choose what he or she wants to do with us next and then sign off when it’s done so the next adult up to bat can see what was covered. 4. Track what items have been completed. Make sure that all the adults are familiar with how to track completed assignments. We simply place the child’s initial after the completed assignment on the IG. You may also find it beneficial to discuss what needs to happen in order for the assignment to be deemed complete; decide if you are looking for coverage or mastery of the material. 5. Suggest or prepare activities in advance. Making sure all necessary materials for a science project are available or the current Read-Aloud is nearby can help ensure schooling gets done. Our current Read-Aloud is always kept at the same place in the kitchen. Sometimes we have more than one Read-Aloud going at a time, so that whichever adult has started the book can also finish the book. We enjoy the stories too and don't want to miss out on any chapters! Life is going to happen. Sometimes reading aloud is the only thing that gets done. Perhaps there is a struggle with some element of handwriting. We do our best to be patient, pray, and be prepared to adjust routines as needed to best fit our family. 7. Keep the focus on the family. Focus more on relationships and connection versus mastery of academics. Family should always come first. For us, God is at the very heart of family. Learning and education should never come at the expense of these relationships, but foster, encourage, and grow the family. Sharing the responsibility of homeschooling over more than one generation can be challenging, but hugely rewarding both for the kids and for the adults! If you have family either nearby or sharing a home with you, I encourage you to include them in your educational plans. I hope you too will be able to find the joys that can be found in intergenerational homeschooling! 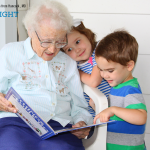 A clear homeschool plan—such as the ones laid out in Sonlight Instructor's Guides—is key for intergenerational homeschooling. Try three weeks of any Sonlight Instructor's Guide for free, preschool through twelfth grade.